I had the opportunity recently to climb the observation towers on Dave’s Mountain and Shephard’s Mountain. These monadnock mountains are outlying peaks of the Uwharries, a small chain of mountains in central NC. 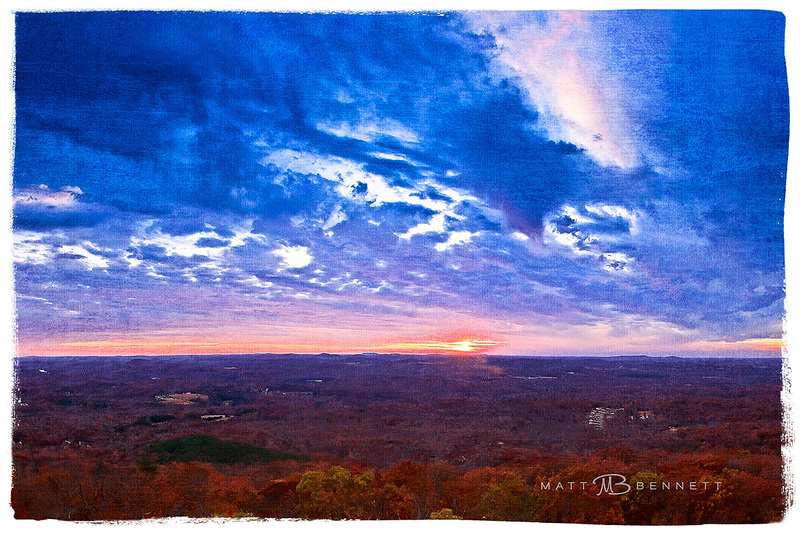 Dave’s Mountain is located in Asheboro, with an elevation just under *1,100 ft. If you’re traveling south on Hwy. 220 bypass in Asheboro, you’ll see the mountain on your right just before you get to the Hwy. 42 exit. The 100′ fire tower on the summit was built in 1950, and according to the NC Forest Service was manned until 1996. Access is restricted, and you would have to contact the NC Forest Service for permission to go up. Once above tree line, you pretty much have about a 360 degree view of the piedmont. The only obstruction is another communication tower, which does block part of your view to the east. The mountain unfortunately has pretty much been all developed. It’s a shame the city didn’t designate a small area at the top of the mountain for a park. What a great feature that would have been for Asheboro and Randolph County! If keeping the tower was too much a liability risk, a small area could have been cleared and you would still have a great view. Shephard’s Mountain is the highest point in Randolph County at approximately *1,157 ft. I’ve seen this mountain at a distance from at least a dozen or more different locations from all over the county. The fire tower there is 125′ tall, and was relocated to the mountain summit in 2000. If conditions are right you can see Winston, Greensboro and High Point. Pilot Mountain and the Sauratown Mountains are also visible as you’ll see from the photographs below. The wind was blowing so hard the day we went up there, it was all I could do to hang on and not loose my gear. As a result, I was disappointed that many of my shots were not as sharp as I had hoped. The property is owned by Mount Shephard Retreat Center, so access to the tower is restricted. 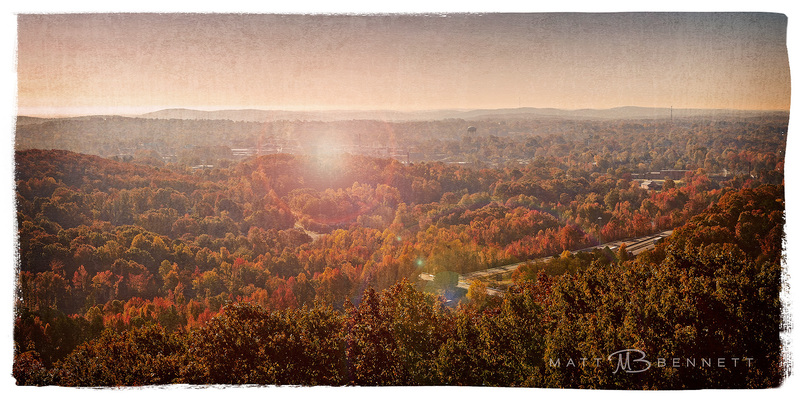 There is a lot of history associated with Shephard’s Mountain and the surrounding area. I’ve heard stories over the years about friends who went searching on this and other mountains in the county looking for the elusive “cave” that John Lawson mentioned in his book A New Voyage to Carolina. I know there are a lot of old gold mines nearby, probably most notable is the Hoover Hill Gold Mine. That property was sold and appears to have been cut up in small lots and developed. It makes for a huge eye sore when looking NW from the tower. I knew the couple who used to be the caretakers at the Mt. Shephard camp years ago. I remember them showing me a shoe box full of arrowheads they had collected during their time there. It was then I also learned that this property is also home to a historic pottery site. Just a quick plug for the retreat center at Mt. Shephard. If you have children and are looking for a nice summer camp they can be a part of, I can’t think of a better place locally. You can check out all they have to offer on their website (link below). Here is an interesting article from Asheboro Magazine that talks about the history of Dave’s Mountain. *Note: I’ve found conflicting information as to the exact elevations of both Dave’s and Shephard’s mountains. I will have to do further research to determine exact elevations, and I’ll follow up on that in a future post. The next mountain over is Back Creek Mtn. To the left of that is Caraway Mountain, and then Shephard’s Mountain. 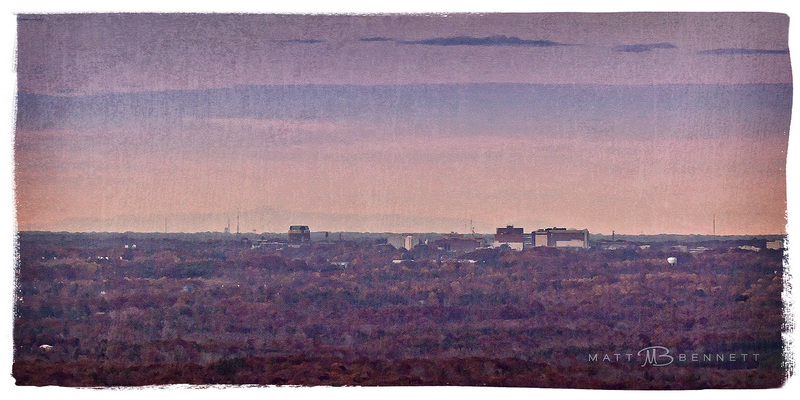 Downtown Asheboro as seen from the tower on Dave’s Mountian. High Point from Mt. Shephard zoomed in 300 mm. 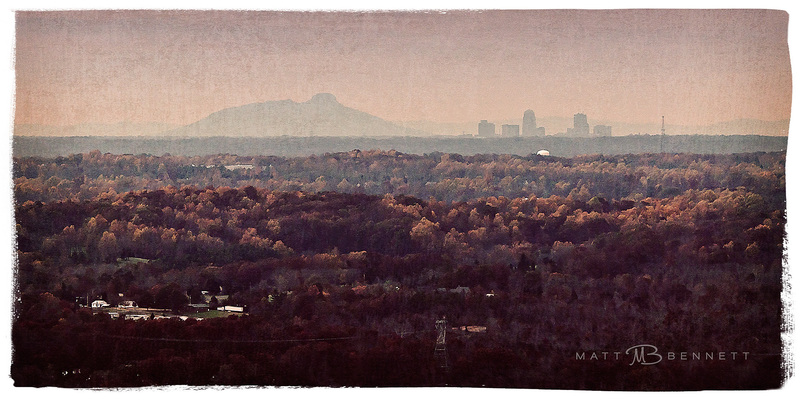 Winston-Salem and Pilot Mountain from Mt. Shephard zoomed in at 300 mm. Photographic Notes: All shots taken with a Nikon D90, 18-200 mm VR lens and 70-300 mm VR lens. I had a tripod with me on both trips, but it really got in the way more than it helped. Plus, you only have so much room on the stair landings. Next time I’ll plan to carry some type of flexible-mount tripod to wrap around the cross beams. It would also help with doing panoramas, as you would lessen the risk of getting the support columns in your shot. All photographs copyright Matt Bennett Photography. I just required some information as well as had been looking on search engines for it. I frequented each web site which came on very first web site as well as did not obtained any kind of related end result i quickly thought to take a look at out the 2nd 1 and got your site. this really is what I desired! This is all really a new comer to me and this publish truly opened up my personal eye.Thank you for sharing around your wisdom. Thank you for composing ugg boots mini informative content. Im impressed with your ability to write persuasive material. Youve given me Highkoo Ugg Boots a large amount of thought-provoking views to consider. I just want to tell you that I am just very new to weblog and absolutely liked this website. Very likely I’m want to bookmark your blog . You definitely come with fabulous well written articles. Many thanks for sharing your website page. Simply desire to say your article is as surprising. The clarity in your post is just spectacular and i could assume you’re an expert on this subject. Well with your permission allow me to grab your feed to keep up to date with forthcoming post. Thanks a million and please carry on the enjoyable work. Got a lot out of your blog post, many thanks. I like this web site its a master peace ! Glad I detected this on google. “Don’t spend time beating on a wall, hoping to transform it into a door.” by Dr. Laura Schlessinger.